Peridot Nail Salon will be having our Re-Grand Opening party on February 18th (since we did not get a chance to do so last year) and we wanted to celebrate the Chinese New Year with a big bang! Please join us sharply at 9 am to watch the traditional Dragon dance by professional dancers and some complimentary food and drinks for our celebration! Peridot Nail Salon offers great service, as well as an inviting and clean atmosphere. By researching, marketing, and testing the local and national trends, Peridot understands that different people need different things, therefore we offer our customers a palette of top quality products along with the most popular services needed by clients today. Peridot services include; Spa pedicures, manicures, pariffin dips and waxing services. 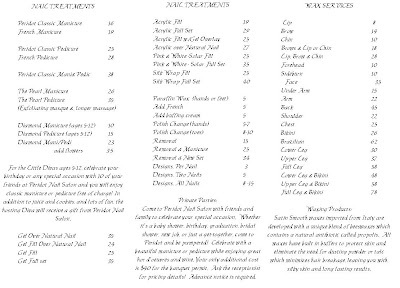 At Peridot, we are proud to offer a varity of products to help us with the personal services we provide you. SpaRitual – Peridot is proud to be among one of the first local nail salons to use SpaRitual, one of the first vegan families of multipurpose spa lines. SpaRitual uses naturally colored vegan ingredients from arount the world! As a growing national trend, the use of vegan or organic products is becoming the preferred choice. OPI – OPI is reowned globally for its Nail Lacquers – a brilliant, chip-resistant, professional formula that is always ahead of its class in colors. Not only that OPI products is used and loved by professionals around the world, all of its nail lacquers are not tested on animals. Peridot is proud to offer OPI as one of its many products. China Glaze – The manufacturer behind the product is AII – American International Industry. For 35 years. AII has been the leading manufacturer of quality beauty products for men and women. China Glaze NailLacquers has a long- wearing formula that uses the latest technology that carries the lacquers smoothly from the brush to your fingernails. For our waxing services, Peridot uses Satin Smooth waxes which are imported from Italy. Satin Smooth are developed with a unique blend of beeswaxes which contains a natual antibiotic called propolis. All waxes have built in buffers to protect the skin and eliminate the need for dusting power or talc which minimizes hair breakage leaving your skin feeling silky and smooth with long lasting results everytime. With the knowledge of our products, clients can push back in one of the plush massage recliners, with a drink in hand, and prepare to be pampered! Peridot’s great service doesn’t begin or end with each client. Peridot knows how important it is to take proper precautions on cleanliness and sterilization. In fact, Peridot Nail Salon is one of the few nail salons that uses a medical grade, UltraClave sterilizer on it’s nail tools. Anything that can draw blood—nail clippers and cuticle scissors—will be soaked in a chemical germicide and then place in the UltraClave sterilizer. Peridot will go even further to having personalized buffers, toe seperators and nail filers for every client. Peridot will offer those clients who wears acrylic nails the option to buy their own drill bits, designed solely to reduce the risk of nail infections from using community, multiple-use instruments. Both the nail technician and the client will wash their hands with an antimicrobial soap before nail work begins. Each client will be given a fresh bowl of soapy water to soak their nails in and pedicure tubs will be pre-scrubbed, wiped dry and spray with anti-bacteria agent before every use. Peridot Nail Salon – A full service manicure & pedicure salon that wants to pamper your soles and help you let go of your daily stresses. Innovative and personalized service by professionals. Peridot is not your typical nail salon but a Contemporary Spa parlor where everyone can just drop in for some fun and relaxation The objective in creating Peridot is to offer great quality products along with exceptional nail and waxing services. With state-licensed experience staff, customers can expect the utmost professional pampering for their hands and feet. In addition to the regular pedis and manis, Peridot offers “the Pearl” pedis and manis for those who need a little extra attention on their hands and feet and “Diamond” pedis and manis for little divas between the ages of 5-12.